-All 1st quality DIRECT from ARK distribution warehouses. Call now DIRECT at 407-925-0917 !!! The allure of exotic hardwood lies not only in its beauty, but in the value it adds to the home. 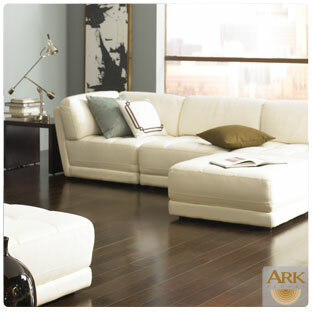 Ark offers two different hardwood flooring constructions... Engineered and Solid. While much ado is made about the advantages of one over the other, the fact is that both are equally beautiful, and in most situations, equally long lasting Ark Floors brand, a division of A&W GROUP, is a United States company that draws an abundant resource of products from global enterprises. Our ability to utilize these resources has positioned ARK as brand that represents the best of both worlds, assuring consistent, first-quality products. ARK’s responsible forestry practices have been recognized by some the world's most prestigious environmental organizations. At Domotex 2009, ARK was awarded Top International Flooring Brand. Don't see the ARK product you are looking for? Call 407-925-0917 for DIRECT PRICING!!! -The Artistic Collection -On Sale !!! -The American Heartland Collection -On Sale !!! -The Elegant Exotic Collection- On Sale !!! -The Estate Collection- On Sale !!! -The French Collection- On Sale !!! -The Patina Grand Collection- On Sale !!! -The Sonoma Collection- On Sale !! !